Most importantly, we encourage children to have fun while learning in a safe and supportive environment. 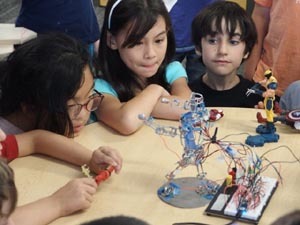 During Summer 2015, we are offering three two-week long sessions – Engineering Explorers (June 15-26) Building Boston (July 6-17) and Cardboard Carnival (July 20-31.) Sessions are available for three age groups – Junior Designers (ages 5-6) Senior Designers (ages 7-9) and Design Leaders (ages 10-12). Extended day is available from 4:00 – 6:00 @ $20/day.